After 63 sold out shows in the U.S. and Canada in 2017, Roger Waters has announced the first of next year's concerts in Europe. Just revealed are 5 shows in Germany and 1 show in Austria in the early summer of 2018. The 2018 European Us + Them tour will visit Portugal through Russia with shows in 21 other countries. UPDATE: Here's the full list of countries that the tour will visit: Austria, Belgium, Bulgaria, Croatia, Czech Republic, Denmark, Finland, France, Germany, Holland, Hungary, Ireland, Italy, Latvia, Lithuania, Norway, Poland, Portugal, Russia, Spain, Sweden, Switzerland and the UK. Watch out for full details of cities and dates following soon. 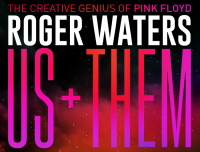 Dedicated pages for each show on the tour are now live, joining the dates already shown in the 2018 Roger Waters tour area. As the rest of the European tour is announced, a page for every concert will be in place: the place to find out information on each show, and to see, once the concert has taken place, pictures, video and commentary.